There are plenty of ways to make and enjoy art. Famous paintings can often see new life in fresh forms like cakes, gifs, and interactive websites. Here's how some people paid tribute to their favorite famous painters. Anything can be a canvas, even a cake. Food artist Maria A. Aristidou arms herself with a paintbrush and transforms cakes into masterpieces. The gorgeous desserts were made for Vienna Boutique Cake Gallery in Larnaka, Cyprus. The artist has painted Starry Night, The Scream, The Persistence of Memory, and others onto the fondant frostings of multi-tiered cakes. Cakes aside, Aristidou is also known for her work with coffee, which you can check out here. It seems like hair colors can be inspired by anything from galaxies to sunsets. Kansas-based hairdresser Ursula Goff considers herself an art history buff, so she gets her color palette ideas from iconic works of art. For example, she channels Vincent van Gogh by dyeing hair with various hues of blue, yellow, and green to mirror Starry Night. With murky greens and teals, she can recreate Claude Monet’s water lily series. Her fine art series also comes with captions, giving readers a short history lesson to go along with the hair. You can check out the whole collection on her Instagram. It turns out, the frothy tops of egg white cocktails are perfect canvases for fine art. Mixologist Rajendra “Rush” Limbu of the Artesian lounge, inside the Langham Hotel in Hong Kong, creates gorgeous cocktails that are actually intricate homages to famous artists Piet Mondrian, Vincent van Gogh, and Salvador Dalí. The drinks are made using ingredients that are chosen to reflect the art. Australian artist Lauren Spark took on the challenge of bringing a timeless piece of art to an embroidery hoop with this faithful recreation of van Gogh’s Starry Night. Using Google Cultural Institute’s high resolution views of the painting, Spark was able to replicate all the important details van Gogh put into his iconic work. The elaborate creation took 60 hours to complete. Watching videos of dominoes falling is so satisfying because it’s all the payoff with none of the hard work. This particular video is extra special because when all the pieces fall, it reveals van Gogh’s Starry Night. (If you can’t tell from this list yet, people really love that painting.) The video was created by YouTuber FlippyCat, who has also has a Mona Lisa version. Love miniature art? You’re going to really like Katsushika Hokusai’s The Great Wave off Kanagawa squished onto a pumpkin seed. The impossibly tiny painting was created by Russian artist Salavat Fidai who has a series called Famous Paintings On Miniatures. Some other creations include the Mona Lisa and The Scream. Fidai is such an expert at miniature art that he can also carve detailed figures out of pencil graphite. With so many crazy Oreo flavors on the market these days, there are more frosting colors to work with than ever before. 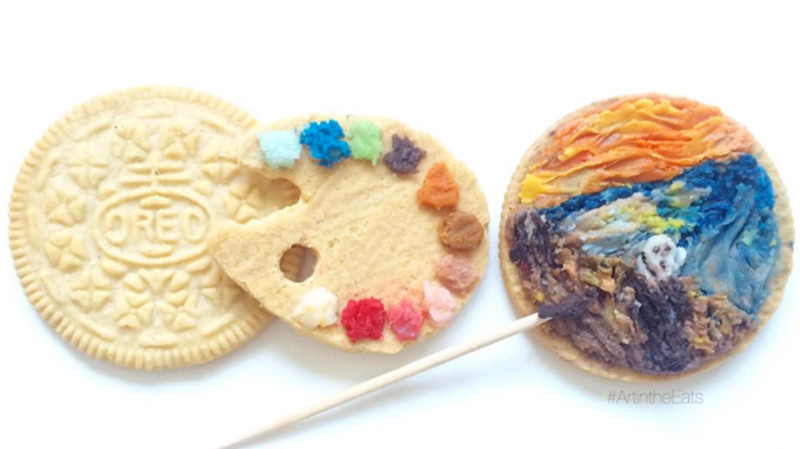 Artist Tisha Cherry uses these interestingly hued frostings to create Oreo art. Many of her creations are pop culture icons or logos, but she also recreates famous paintings by Frida Kahlo, Rene Magritte, and more. Cherry uses a toothpick to move the frosting around and shape it into tiny masterpieces. While they look pretty, they probably don’t taste great, considering the artist mixes together frosting flavors like pumpkin and mint. Stop by Hugo Coffee in Park City, Utah and you can enjoy some adorable latte art featuring a paw print (the café’s mascot is a dog). But that’s not at all you can get: According to one Yelper, you might be lucky enough to get Starry Night swirled into your coffee. Other baristas have recreated artwork like The Scream and Salvador Dali’s The Persistence of Memory. If you stop by the Paris bakery Fauchon, you can get an eye (and mouth)-full of some seriously gorgeous éclairs. The traditional French pastry works nicely as a tasty canvas for all sorts of designs, like The Great Wave off Kanagawa. Each design is printed with edible ink onto fondant. Thanks to the internet, there are countless new ways to enjoy art. Just look at these interactive versions of Starry Night and Garden of Earthly Delights. There’s a lot to unpack with Bosch’s triptych, and every inch of the painting is more confounding and bizarre than the last. A team of filmmakers, photographers, and art historians that worked on the documentary Hieronymus Bosch, Touched by the Devil helped bring an interactive website to life that will walk you through each section. You can click on over 40 different sections of the painting to hear an audio essay explaining the context and symbolism of what’s depicted. The Starry Night rendition is less informative, but just as entertaining. Greek digital artist Petros Vrellis made a moving version of the painting that swirls and shifts when touched. With a simple swipe, the thick brushstrokes warp and change. You can play with the painting yourself on your phone by downloading an app from Google Play or iTunes. Korean artist Lee Kyu-Hak imitates the thick brushstrokes of van Gogh by wrapping thin blocks of wood in colorful newsprint. The collages were recently featured in the New York gallery Blank Space. Looking at (and sometimes eating) art is fun, but what if you could sleep in it? Art Institute of Chicago and Airbnb teamed up to make van Gogh’s famous bedroom (from his series Bedroom in Arles) a real-life room that you can really sleep in. The mind-bending room managed to successfully recreate the topsy-turvy perspective and streaky painted surfaces. The room, which could be found in Chicago's River North neighborhood, was available to rent on Airbnb for $10 until May 10. It was created in honor of Art Institute of Chicago’s exhibit “Van Gogh’s Bedrooms.” The event featured all three paintings van Gogh created of his now-famous bedroom, which had never been displayed together in the United States before. Italian artist Marco Sodano recreates famous paintings using LEGO bricks. The result is a series of pixilated works that strongly resembles the original paintings, despite being stripped down to minimalistic shapes. The artist’s main idea was that any child using LEGO bricks could be as good an artist as Leonardo da Vinci or Vincent van Gogh. The work caught the eye of LEGO, who decided to use the artwork in an ad campaign. Wear famous paintings from master artists like Manet and Munch right on your feet with the help of art-inspired socks. There are a number of different sellers on Amazon that can supply you with dozens of pairs of artistic footwear, and you can check out all the options here. Some of our favorites include Botticelli’s The Birth of Venus and Klimt’s The Kiss.